Twenty-five years ago Charlie Daniel mentioned Lynyrd Skynyrd in his tribute to all things southern and rock in 'The South's Gonna Do It Again.' Still ornery, rebellious, and one hundred percent red, white, and blue Americans, Lynyrd Skynyrd rolls on with Gods & Guns. With a title like that these wild-eyed Southern boys would be as a happy to spit in a liberal elitist eye as take a stand in a barroom brawl. Skynyrd is still singing about what the know best, their Simple Life and Southern Ways. These two songs alone define what has always been Southern rock: a love a good time, God, my guns, my country (not necessarily in that order), so leave me the f*ck alone. This maxim rises in That Ain't My America and God & Guns where everything from the forgotten young soldier to the price of a tank of gas (in their pick-up truck, of course) is lamented as unamerican. But their God is the neutered god of American folk religion having no justice, righteous, and certainly no sovereignty over their lives. Neither the God of the Bible (they allude to) nor a foreign power will have sway over them. Their religion is patriotism as long as love of country serves their personal interests. But I digress. Gods & Guns is vintage Lynyrd Skynyrd without the irrepressible hooks that flooded Street Survivors and would have surely propelled them to greatness in the day. Still, the conviction remains, and today Lynyrd Skynyrd is harder, grittier, and uniquely lovable as ever. Still Unbroken, Southern Ways, the self-promoting Skynyrd Nation, and Storm still have teeth and show that the power of early Southern rock is still viable today. Spinning a ballad is no problem either. The hokey Unwrite That Song mingles with the profound Gifted Hands (the only song that comes close to authentic representation of the Christian God) to tug at your heart strings. 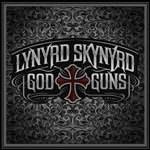 Ultimately, for the Skynyrd Nation Gods & Guns will be like sippin' Jack Daniels on the back porch on a sleepy Southern Saturday night. For the Skynyrd Nation Gods & Guns will be like sippin' Jack Daniels on the back porch on a sleepy Southern Saturday night.